If you’re looking to grow your blog’s readership, you should think beyond scheduled Tweets as a means to drive traffic. Igniting a swarm of consistent, engaged readers to your site is key, and driving them there through email is a traffic-driving strategy that should be on your mind. But with social media, isn’t email dead? Hardly. Remember – every single one of your Twitter or Pinterest followers or members of your Facebook community had to have an email address to create an account. And with newsfeeds moving at an increasingly real-time speed, they may not see that update you send promoting today’s post. You want them to get it personally in their inbox. In our previous post on Alternatives to Feedburner, we listed out several different email service providers that are great options for delivering your blog updates to your readers. (And hey, for right now, Feedburner is still an option.) No matter what email service provider you’re using, here are some tips on growing your blog’s email subscriber list that will increase the visitors to your blog and your opportunities to create a business from writing about what you’re passionate about. We do this on our blog because we want you to get our email updates. Think of it this way: If someone makes it to the bottom of your post, they were pretty engaged with your content. Ask them to sign up and get more straight to their inbox. We also put our link to our email sign up form at the top of our sidebar and recommend you do the same. Yes, even above your ads. Think of it this way – the more energy you spend sending people away from your site through those ads, the less likely they are to convert into a regular reader that clicks on those ads. 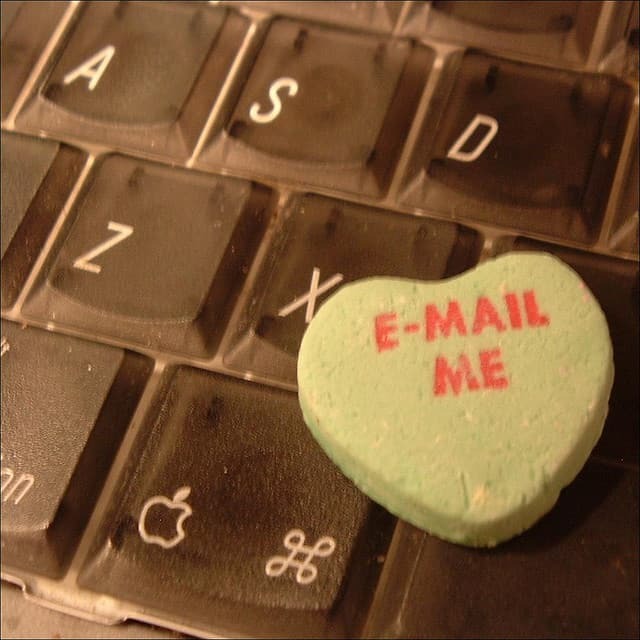 Get those emails and get those readers enjoying your content first. 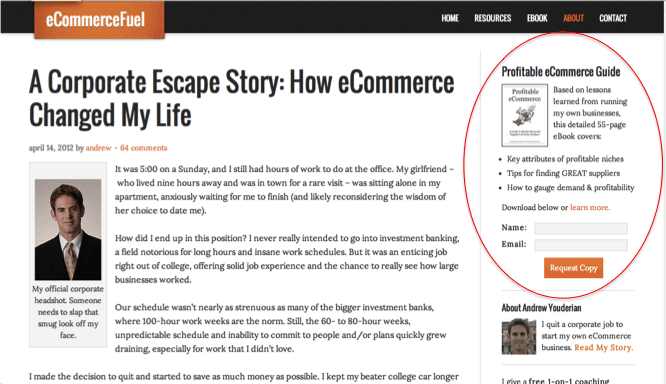 On his blog, eCommerceFuel, blogger Andrew Youderian encourages his readers to subscribe with the offer of his free eCommerce eBook. I’m sure you’re on Twitter, Facebook and Pinterest. Maybe you have a long-neglected MySpace you’re considering firing up again. Do you need a link to every single thing you’re involved in? This will only distract your potential subscriber. I like Derek Halpern’s approach on Social Triggers. He doesn’t prompt you to follow him on Twitter until you’ve subscribed to his email updates. Then you get a prompt to follow him on Twitter on the thank-you page. Check out your Shareaholic Analytics and look at the Top Content – Your About Page probably gets a lot more traffic than you think! Why not promote your email list there? Try it out and see if it gives your list a boost. If it doesn’t after a month or so, you can always take it away. Don’t be afraid to test. This one is a catch-22: Do you want to use a solution like Livefyre or Disqus the enables folks to easily login with Twitter and Facebook to leave a comment versus needing to register an in order to comment? Or would you prefer to generate email subscribers through comments on your posts using something like Comment Luv or the built-in WordPress commenting system? Mind you – with the handy work of a smart developer, you can tweak many of these options to either enable you to generate email leads or enable social login. 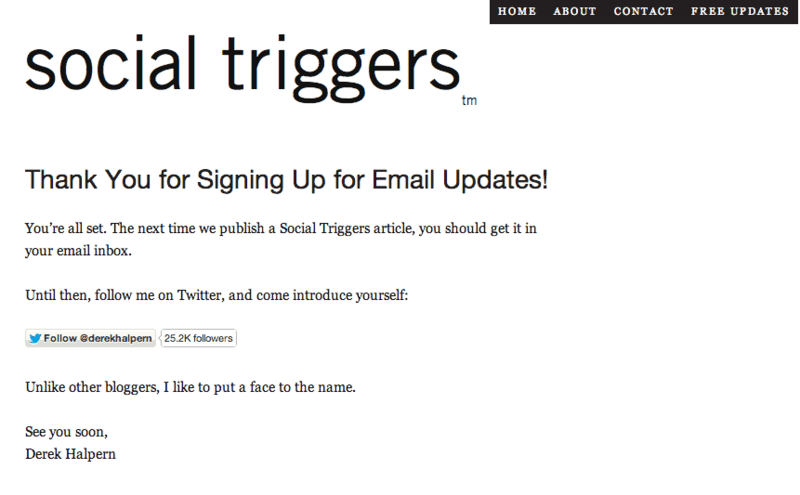 Depending on your goals, this is another area that you can generate email subscribers to your blog. Shareaholic Publisher Lindsay of The Lean Green Bean held a 6-week community-building support group for her readers called Elf for Health. Lindsay is a fitness blogger, so the premise of her effort was to connect readers with a “buddy” so they could encourage each other to stay on track during the holiday season. How would they communicate? Email. Whether Lindsay chooses to add all of these addresses to her subscription list is up to her – but she has that option. And I’d bet that with such an engaged group, many of them have already signed up to hear from her anyway. What tips do you have for growing your blog’s email list? Let us know in the comments.